Let’s not try and deny it: the netbook market is painstakingly boring. At the start, it had some imagination. Expensive Windows licenses were pushed aside for custom Linux distributions which were great to try out, but of course Microsoft came along eventually and killed off the resurgence of the Tux yet again. A few years on and things haven’t really changed. Almost every netbook on the shelf now runs Windows, probably Windows 7 Starter Edition, the vast majority run on an Intel Atom processor, have the same amount of RAM, the same graphics chip and the same form factor. Don’t say I didn’t warn you: the netbook market is painstakingly boring. Fortunately for us, there might be one netbook that has brought a smidge of differentiation to the market. The Acer Aspire One is 10.1″ big – pretty standard – but that 10.1″ display doesn’t have a resolution of 1024 x 600, but a HD resolution of 1280 x 720. The most common complaint about netbooks is that they’re difficult to be productive with. You can’t fit a lot on the display with a resolution of 1024 x 600, so the bump in both resolution and pixel density may cause you to take a second look at this machine. Also, it doesn’t run on an Intel Atom CPU, instead opting for a dual core AMD processor. Unfortunately, that’s where the good news stops on the specifications front. There’s only 1GB of RAM in this particular Aspire One, which could get very painfully very quickly on Windows 7 – maybe Acer should reconsider a lighter, custom Linux distribution like they did with the original Aspire One model way back when. You get a decent amount of storage for your pounds with this machine, as it ships with a 250GB hard drive, although an SSD option would have been nice for those who didn’t want to take a lot with them whilst offsetting potential performance bottlenecks caused by the lack of RAM. It could also have improved the battery life of the machine, which is rated by Acer at 6 hours, but unfortunately real life tests get nowhere near that figure. If you’re going to be taking this machine to its limits then you can expect a little under half of that figure. I would quote you a figure for HD video playback as well, but that’s a no go on the 522 as it can’t playback HD footage without turning it into a game of “how long can you watch until you throw me out the window?”. 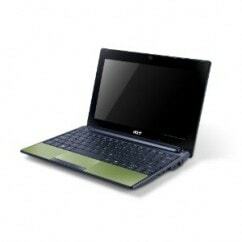 Acer could have been on to a real winner with the 522. It has a nice design, and the green option adds a bit of zazz to the whole situation. Add that to the HD screen and all you need is a good battery and relatively powerful insides to make this a killer netbook. Unfortunately, it’s lacking in the last two. Despite this, the screen is the best I’ve seen on a netbook in a long time, so it’s well worth checking out if you’re looking for a new netbook but don’t care about watching HD video. You can buy the black version for £234.77, and the green – well worth an extra tenner – is available for £199.99 from Amazon. If the 522 doesn’t tickle your fancy, check out our list of 5 netbooks that may be more suited to your needs!